How do you crew a ship whose mission will take hundreds or thousands of years? Let’s see, you could do a sleeper ship, a generation ship, for something a little more unusual you could go the route of Marina Lostetter’s Noumenon or David Brin’s Existence. Those options will surely cover you for a few hundred or maybe a thousand years. But what if the ship’s mission is even longer than that? What if we’re talking more like a million or more years? The mission of the Eriophora is building a gate system through the galaxy. As the gate system grows, the outbound growth of mankind will surely follow. Sunday and many of her crewmates are forever hopeful that something almost human will come out of the next gate they build. They are forever hopeful that their ship will finally receive a radio message that it’s time to come home. It’s been sixty million years, and they are still waiting for that message. No wonder the crew forms a music appreciation club, it’s not like there is much of anything else to do. Yes, you read that correctly, they’ve been hurtling through the galaxy, awake for only a few days out of every few hundred or thousand, for sixty million years. The solution sounded so simple, once upon a time. Raise a bunch of children to feel special, to feel chosen. Train them together, let them watch their AI grow and learn. Raise them to know the ship is their home, and everything they do, they do for the future and the betterment of mankind, and that being awake for 3 days out of every few hundred years is a completely normal thing. Trust the AI to keep them in line and convince them that it’s totally normal that in millions of years no one has invited them to come back home. the abnormal repetition of the actions of another person. Daniel Bruks is a regular human. Living out in the desert after committing career suicide, Bruks is just a regular guy. And by regular, I mean he has no augments and his DNA and brain haven’t been mucked around with. By regular, I mean humanity is, in general, leaving him behind. But so long as they leave him alone, he’s fine with that. Bruks keeps saying he doesn’t understand what’s happening, or why the Bicamerals even took him along on their mission when it would have been much easier to leave him behind. He’s not alone, as for the first half of this book, I had no idea what was happening either. Watts certainly throws the reader into the deep end, and it was a frustrating first hundred pages. Luckily, about a third of the way in, there are some conversational infodumps that tell you exactly what all these augmented humans are, and what Bruks is not. And maybe Bruks will eventually come to realize all the mean names the augments call him, names like roach and baseline, aren’t insults at all. 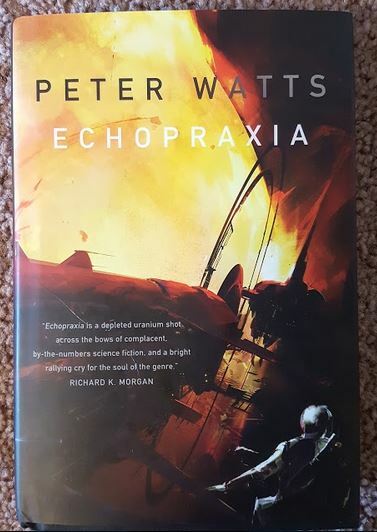 Echopraxia takes place in the same universe as Blindsight, and if you haven’t read Blindsight it is 1) one of the most incredible hard scifi novels ever written, and 2) won’t much prepare you for Echopraxia, as these two novels are those distant cousins who see each other at weddings and funerals, but can’t think of a reason to speak to each other. That said, I couldn’t stop thinking about Blindsight while reading this novel. There is so much discussion in Echopraxia about how you can’t trust your own brain, you can’t trust your own perception. Blindsight was ALL ABOUT perception, and we see that story from Siri’s point of view, and of course he trusts his perception. It makes for a fascinating dichotomy between the two novels! 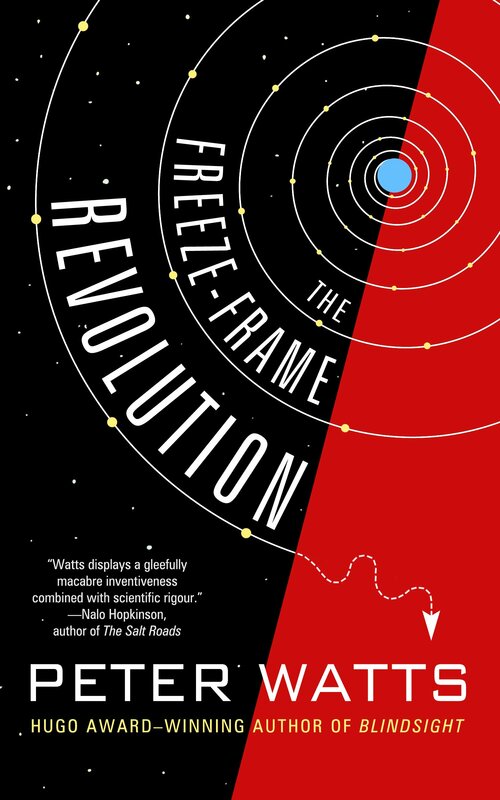 Peter Watts is the kind of story teller who doesn’t let us lie to ourselves. His writing style is aggressive and unrelentingly honest, he understands how easy it is, how natural human arrogance can be. We always think we know best, don’t we? Especially when it comes to people we’ve never met, or creatures we don’t understand. That book, Blindsight, that’s on everyone’s “most important science fiction books” list? This is that guy. 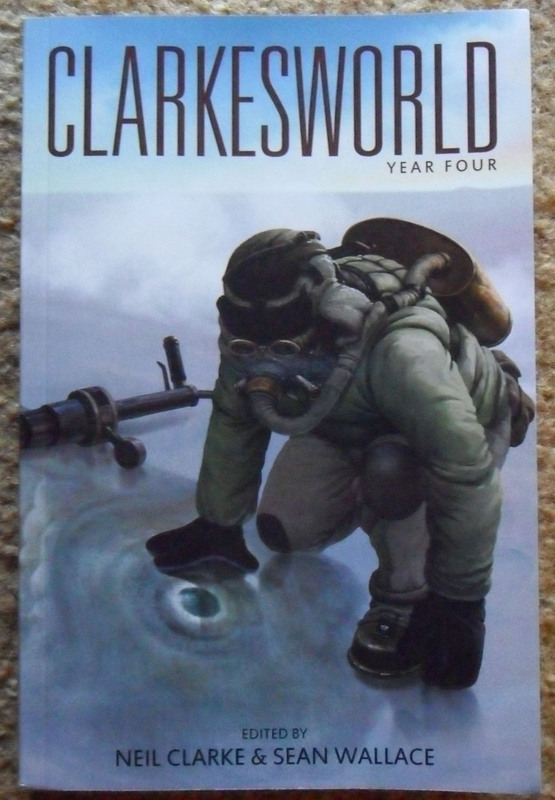 Including two award winning short stories, The Things (which I reviewed here) and The Island, this collection could easily be subtitled “the best of”. Past the award winners, you’ll find the mind blowers – the stories that take what you think you know about how we think about our universe and flip it all inside out. 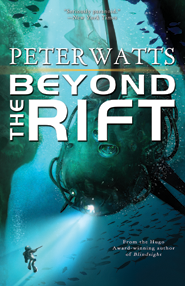 Thought crime control, the crushing dangers of the ocean’s bottom, a new way for religion to work, a woman torn between her own body and that of a four year old child, a prequel to the Rifters trilogy, and so much more await you in Beyond The Rift. Head over to the Tachyon tumblr page to read some excerpts. Be sure to read the Outtro, an intro of sorts, that comes at the end of the book instead of the beginning. It’s important that you read that part, and it’s important that you read it *last*. Watts has a pretty good idea of how most people are going to react to his work, and now he’s going to explain himself. confused yet? intrigued yet? a little of both? Here are my thoughts on my favorite stories from Beyond the Rift. The Island – Like the other workers on the Eriophora, Sunday and Dixon only wake up when they’re needed. 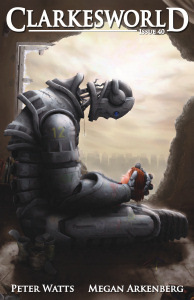 The ship’s chimp brained AI has found a good spot, so it’s time to start building. A gate, that is. Yes, Sunday, Dixon, and the other sleeping crew members are glorified highway construction workers. Sleeping most of the way, they travel far ahead, building transit gates in every corner of the galaxy. Humanity evolved, and left their road crews behind. Sunday can barely even recognize what comes through the gates as human anymore. There is some brilliantly tight world building happening in this story, that’s for sure. Dix is still young, he wants to be awake all the time, he thinks there’s so much he can learn from the ship’s AI, no matter that Sunday tells him she ripped her port out years ago, and for good reason. He’ll barely stand still long enough for her to try to explain what happened all those years ago. Regardless, they’ve found a spot, and construction has begun. And then they find something strange, someone no one has ever seen before. The star they are near, it is surrounded by a sphere of organic material, it’s one huge organism. Sunday even describes it as a giant dyson sphere. She doesn’t want to hurt anything that might be intelligent, even if it’s not sentient, or is, and can’t communicate with them. After studying the star, she realizes it is benign and helpless, and that if she doesn’t move the gate, she’ll kill it. How arrogant, how human she is, to think she can understand this creature. Maybe it can’t communicate in any meaningful way, but it knows how to get what it wants.